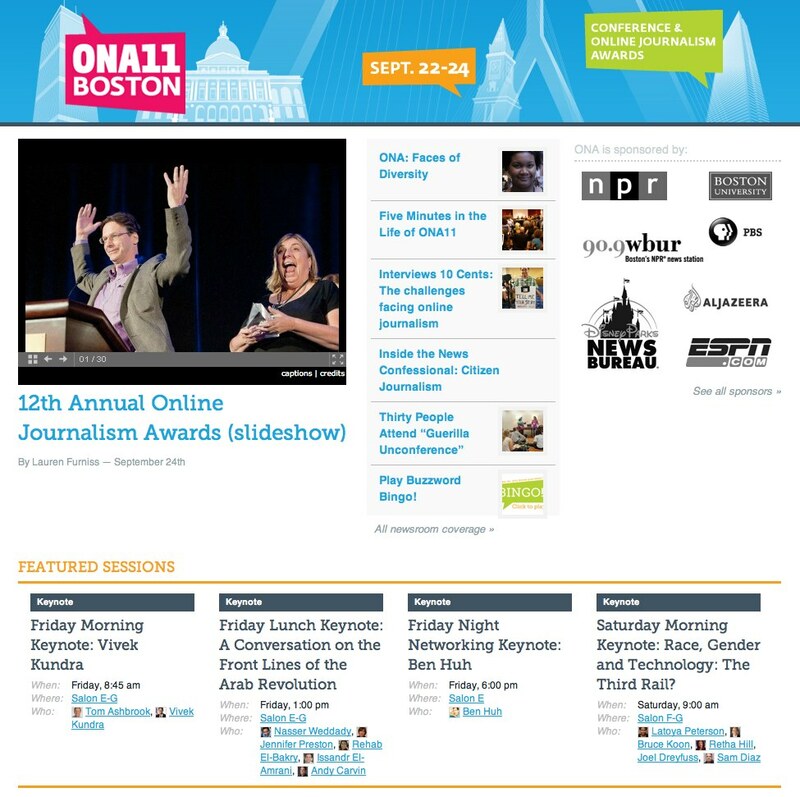 This is a quick post I’ve been meaning to do about the work we did this year on the ONA11 conference website. Background: last year, I was late on getting a conference pass and ended up volunteering for an entire day in the student newsroom. 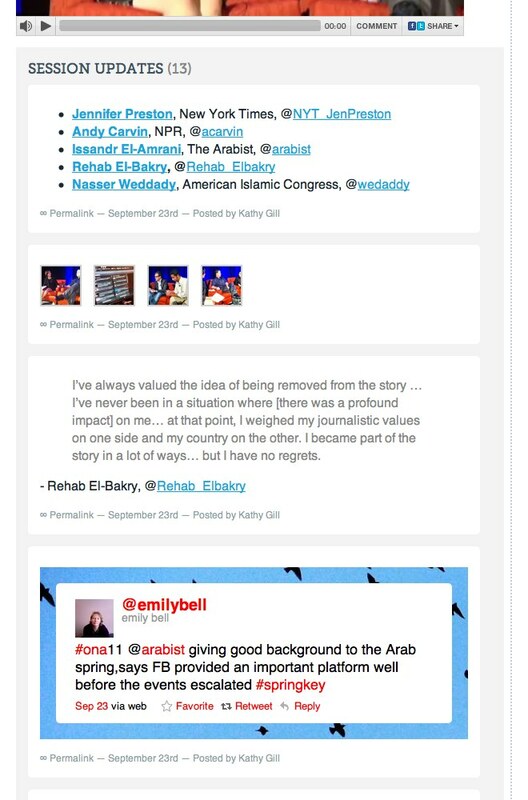 ONA’s student newsroom produces stories, video, and other coverage related to the conference. I had so much fun that I volunteered to do it again this year. I planned to work on it over the summer, but 90% of the work ended up being done in the last week. Before the conference, the focus was convincing journalists to purchase tickets and attend. During the conference, there are two audiences: those who are physically at the sessions and those who want to participate virtually. The former probably want a backchannel for conversation and capturing the highlights, whereas the latter probably want to participate in realtime as much as they can. After the conference, everyone wants to access a historical archive of the content presented in sessions, either to catch those they missed or find the link they heard referenced. With this in mind, we worked on making the website dynamically reflect these needs. It was helpful, although somewhat distracting from the experience, that I was working on the website during the entire conference. Session pages as a custom post type. This gave us a structured database of all sessions and allowed us to easily build a session listing, etc. Using Posts 2 Posts to associate posts and presenters with session pages. Our realtime curation crew could easily publish content from the WordPress admin, associate it with a session, and have it automatically pulled into the session page. 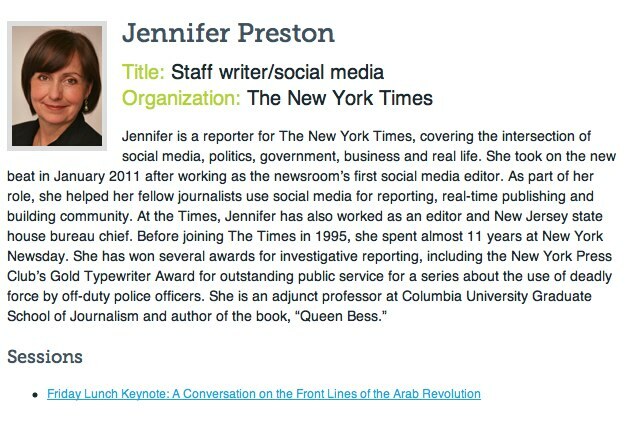 Furthermore, every presenter had a dedicated profile page and their information could automatically be pulled into other contexts on the website. Auto-showing the livestream player on an individual session page based on timestamp. Every session was associated with a track and I had a bit of logic to pull in the correct livestream based on current time, session start, and session end. Showing the session updates in reverse chronological order during the event (because the user is most likely refreshing the page and wants the most recent updates at the top) and then flipping to chronological order 15 minutes after the event. Leveraging the Zoninator on the homepage for featured stories and events. Editorial loved that they could have full control over which stories were highlighted. WordPress normally lists headlines in reverse chronological order, and developers hack this with “featured” categories, etc. Post formats presented content exactly as it was intended to be presented. I was particularly proud of my gallery implementation, even if there weren’t the visuals to go with it. Get started earlier so these features are actually fleshed out before the day of. 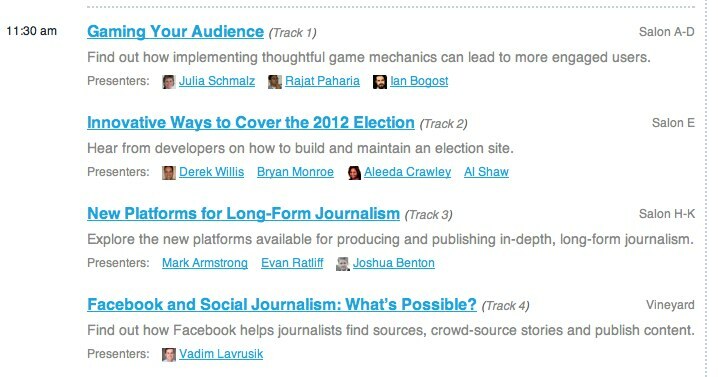 Allow for “featured” session updates a la NY Times Editors’ Picks for commenting. Guest session update submissions with a moderation queue. 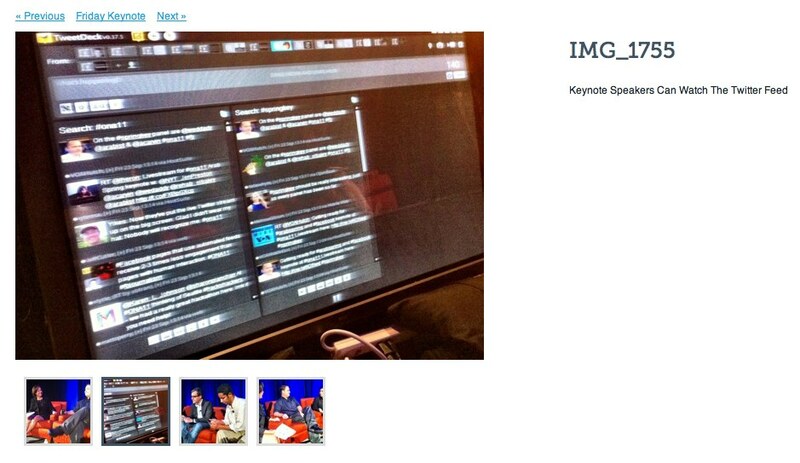 Live update the session page so it’s essentially liveblogging with rich media. On the all sessions page, show the number of updates an event has, whether it’s currently live/being livestreamed, etc. Order content on the single session page based when it was published (e.g. you can assume everything 30 minutes after the session is coverage of it, whereas during the event is realtime updates on it). Lastly, I have one more idea I’d like to pitch: a way of indicating who you want to meet at the conference. Every attendee that registers get access to a page on the website listing every other attendee. Then, they can go through and indicate whom they want to meet at the conference. It’s a double win; you get to notify who you want to meet that you want to meet them, and you get to see in advance who wants to meet you. For archival purposes, I’ve captured a gallery of screengrabs from the website too. 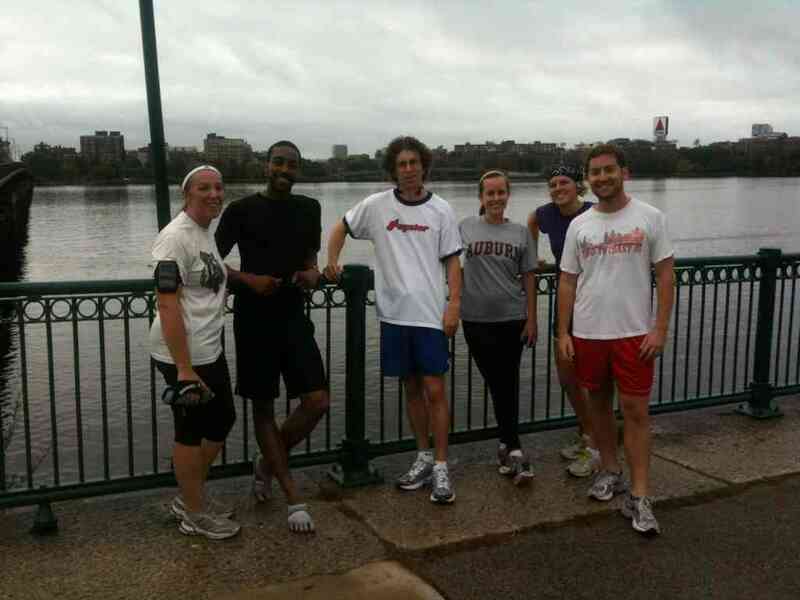 #onarun crew Saturday morning along the Charles River in Boston. Total time: 75 minutes. Photo from Steve. 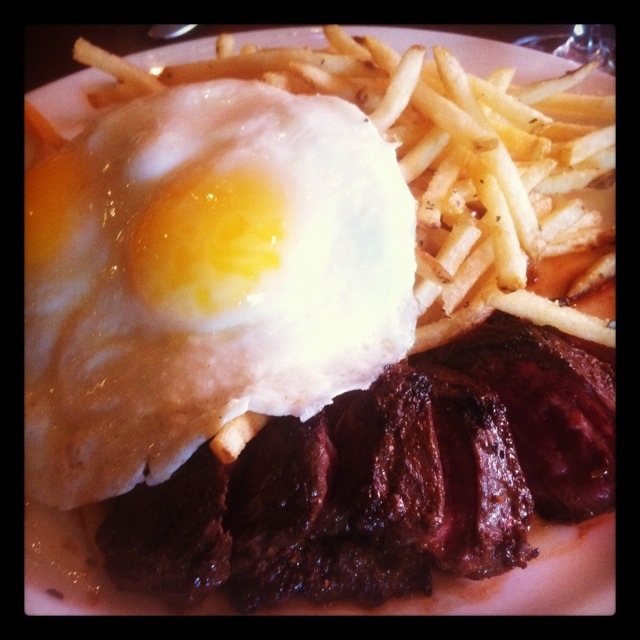 Post-conference brunch with the gang at Sel de la Terre in Boston.